In addition to building deployable packages of applications and other files, Composer allows you to build DMGs of preconfigured operating systems. OS packages can save you time and enhance consistency across your network. 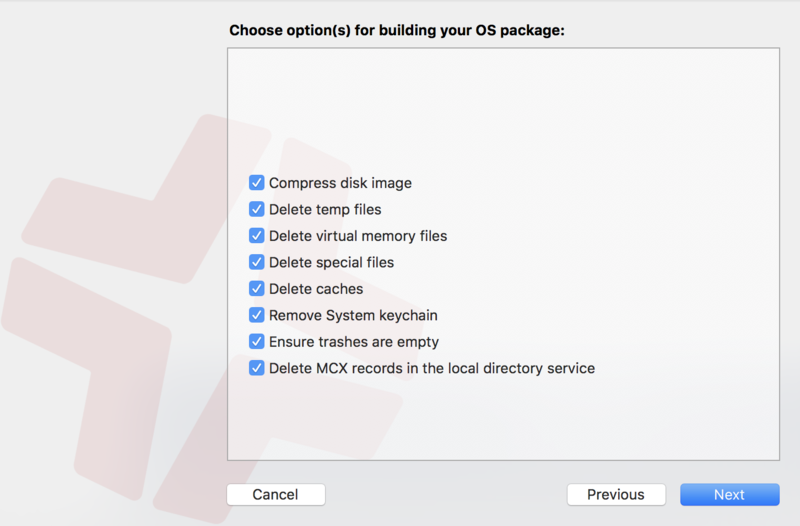 While building an OS package with Composer is similar to building one with the Disk Utility application, Composer allows you to clean up the OS by removing unnecessary files before building the DMG. This option compresses the OS package DMG. This option ensures the files in /private/tmp are deleted before building an OS package. These files are usually deleted during the startup process. This option ensures that Virtual Memory files are deleted before building an OS package, including the potentially large sleepfile. These files are usually deleted and re-created during the startup process. This option ensures that these files are deleted. This option removes files in the /Library/Caches directory before building an OS package. This option removes the System keychain from the OS to ensure that a new System keychain is created. This can prevent the “This computer already exists” error when binding a computer to a directory service. This option empties the Trash for any user with items in the ~/.Trash folder. It also updates a user’s com.apple.dock.plist file to reflect that the Trash is empty. This option removes the /var/db/dslocal/nodes/Default/computers/localhost.plist file before building an OS package. For instructions on how to install and configure the OS before building an OS package, see the Creating a Minimal Base OS Image Knowledge Base article. When you’re finished configuring the OS, boot to another startup disk to build the DMG. Open Composer and authenticate locally. In the toolbar, click New . Under the Operating System heading in the sidebar, select Build OS Package. Select the drive you want to package and click Next. Choose options for removing unnecessary files from the package and click Next. Enter a package name and select a location to save the package, and then click Build. Find out how Composer 9.7 or later displays partitions when building OS packages.